It was his love of history that, in part, led Father Peter Marshall, raised as an evangelical Christian, into the full communion of the Catholic Church. Ordained last June, the priest is now delving into history as the vice postulator of the beatification and canonization cause of the Servant of God Simon Bruté, the first bishop of the Diocese of Vincennes, which later became the Archdiocese of Indianapolis. But for Father Marshall, history isn’t just about studying musty books to learn about the past and those who have gone before us. For him, it is living and a part of who he is. And he hopes that, with Bishop Bruté at least, this will come to be the case for Catholics across central and southern Indiana. “Living history conjures up images of Williamsburg or Conner Prairie,” said Father Marshall, who is also the associate pastor of St. Barnabas Parish in Indianapolis. Father Marshall succeeds Bishop Paul D. Etienne as vice postulator. 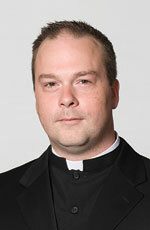 Archbishop Daniel M. Buechlein appointed Father Marshall to this ministry shortly after Pope Benedict XVI appointed Bishop Etienne to lead the Diocese of Cheyenne, Wyo., last October. Father Marshall was honored to be chosen for the ministry just months after he was ordained a priest. “It’s exciting to be a part of the history of the archdiocese, to get to know better the life of such a holy man,” Father Marshall said. As vice postulator of Bishop Bruté’s cause, Father Marshall will promote devotion to and knowledge of him among Catholics, and will help coordinate work at the local level in advancing the cause. “We’d like to get a place, probably in Indianapolis, where we might have an image of him and some information to promote his cause through prayer,” he said. “I’ve promoted him here at St. Barnabas with our school kids. I just try to use the opportunities given to me in my other ministry to promote information and knowledge about Bishop Bruté. Father Marshall said promoting Bishop Bruté’s cause will be a way to help all archdiocesan Catholics grow in faith.